Lowered By 2 to 2 and a half feet (60 to 75 cm). Many explanations for flood damage losses in Canadian cities have been identified - these include urbanization that extended new development areas and intensification within existing development areas, sometimes with limited runoff control. But another type of development can have a clear impact on basement flooding, or sewer back-up risk, and that is the lowering of basements. 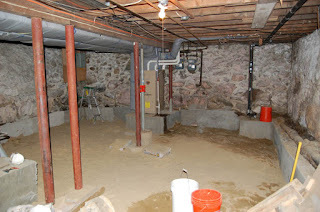 As property homeowners strive to gain the most out of their living spaces in older urban areas where basement heights were often limited, underpinning of foundations can support the lowering of the floor slab to increase headroom and maximize the use of a finished basement. But what does lowering the floor slab do to flood risks? Essentially it reduces the safety factor against sewer back-up but putting the floor and finished contents closer to the elevation of the municipal sewer in the street. In older areas, municipal sewer can be prone to surcharge during extreme rain events, such that sewage and extraneous water rise up well above normal flow levels. So lowering a basement reduces the 'freeboard', or buffer, between a home's valuables and the the level of wastewater in the municipal collection system. Typically a basement is lowered by 2 to 2 1/2 feet (i.e., 60 to 75 centimetres) to give a finished basement height of 8 feet (2.4 metres). Toronto Open Data provides statistics on building permits and description of works that may include underpinning. As house prices have increased in Toronto, homeowners are clearly motivated to increase the amenity value of their basements, whether as second suites or elaborate "man-caves". Trends from 2001 to 2017 are shown below. Several hundred more permits were issues for projects including 'benching' but are not shown. Overall the number of lowered basements increased consistently from less than 200 properties in 2001 to over 1700 properties per year in 2017 - in total 14,000 properties were lowered (adding benching projects to underpinning projects shown). 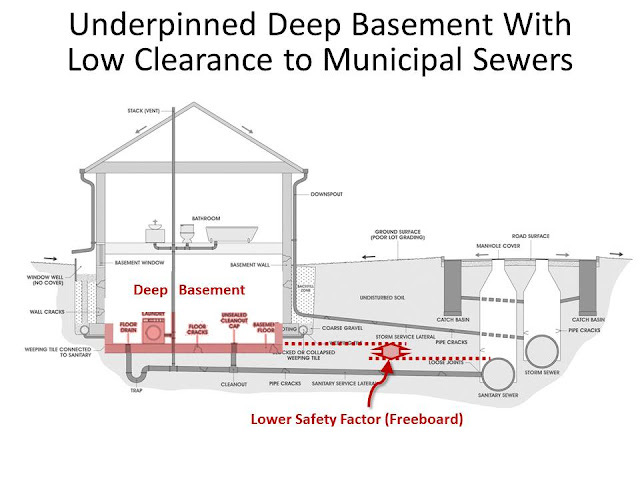 The following cross sections illustrate how lowering a basement reduces the 'freeboard' safety factor, or clearance, between the finished basement floor and the municipal sewer system. 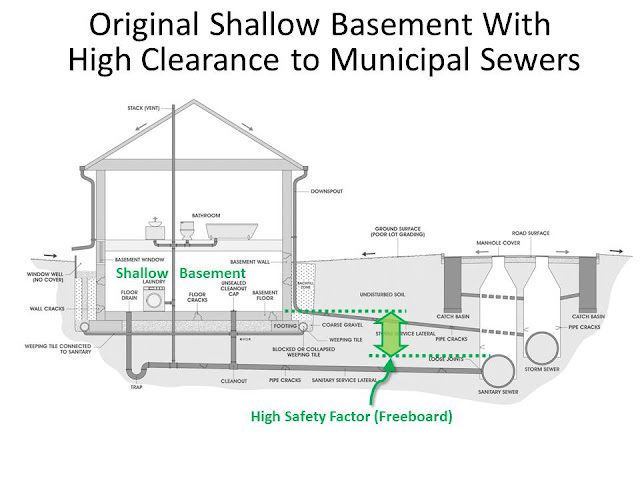 Where sewer elevations are not favourable, ejector pumps for sewage may be proposed which would create a good hydraulic break between the municipal sewer and the lowered / underpinned basement. 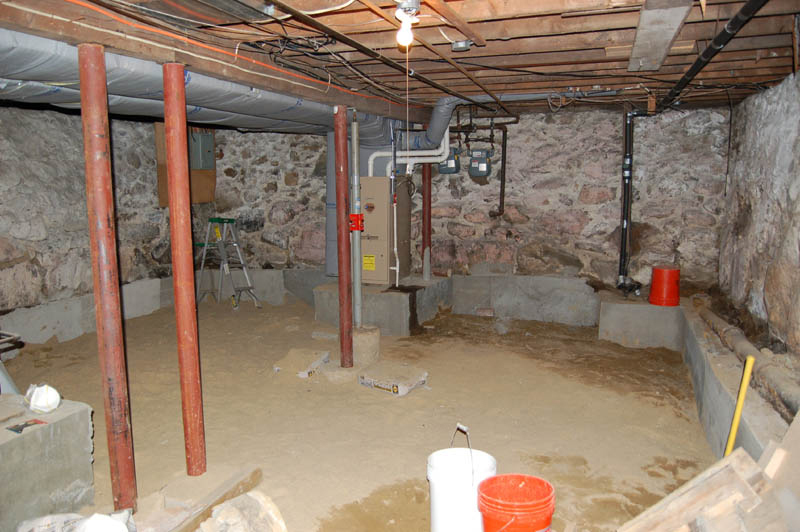 In any case, where a basement is lowered, especially when the new space is then finished and filled with valuable contents, a backwater valve should be installed to reduce back-up risk. This can only be considered where downspouts and weeping tiles drains (foundation drains) are separated from the sanitary lines, to avoid flooding the home upstream of the backwater valve with local drainage.